The International Phonetic Alphabet (IPA) is a standardized system of pronunciation (phonetic) symbols used, with some variations, by many dictionaries. See Phonetic symbol for a list of the IPA symbols used to represent the phonemes of the English language. Note: Do not confuse with the spelling alphabet commonly know as the NATO phonetic alphabet which uses words to spell out the letters of the alphabet, as in Alpha, Bravo, Charlie, Delta, etc. There seem to be very few applications which take IPA text and convert it to sound, though this experimental one from AT&T seems to work. You will need to enter this code <phoneme alphabet="ipa" ph="ˈwɛlkəm"> </phoneme> in the box, and replace the word "ˈwɛlkəm" with the IPA text you want to hear. Please note that it doesn't always work perfectly. The following is a standard chart for sounds in any language. Each symbol represents a precise sound. 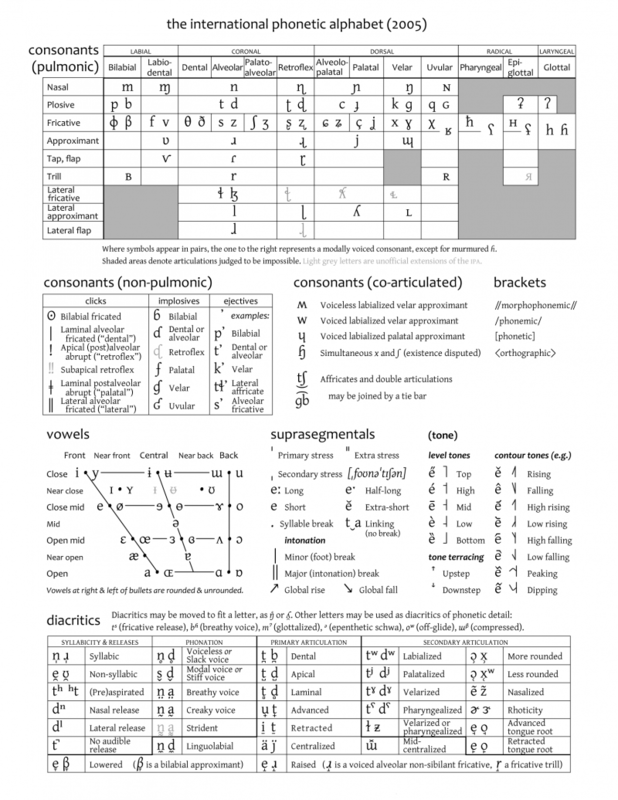 Every language needs an adaptation of the chart in the previous section for its phonemes. For example intervocalic English phoneme /t/ is represented in the table by the symbols [t], [ʔ] and [ɾ], which describe the "t" sound used in different dialects. /t/ on the other hand, is any sound perceived by English speakers as being the same as in better [ˈbɛtəɹ, ˈbɛʔə, ˈbɛɾəɹ] which in broad or phonemic notation is /ˈbetər/. In this table we use /oʊ/ instead of /əʊ/ and /ɛ/ instead of /e/, as is customary in American dictionaries. However in Teflpedia we use /əʊ/ and /e/ for uniformity. Most American Dictionaries prefer /ɑ, ɜ, i, ɔ, u/ instead of /ɑː, ɜː, iː, ɔː, uː/. Paul Meier Dialect Services, IPA charts (mirror). Audio. This page was last edited on 21 January 2019, at 06:15.